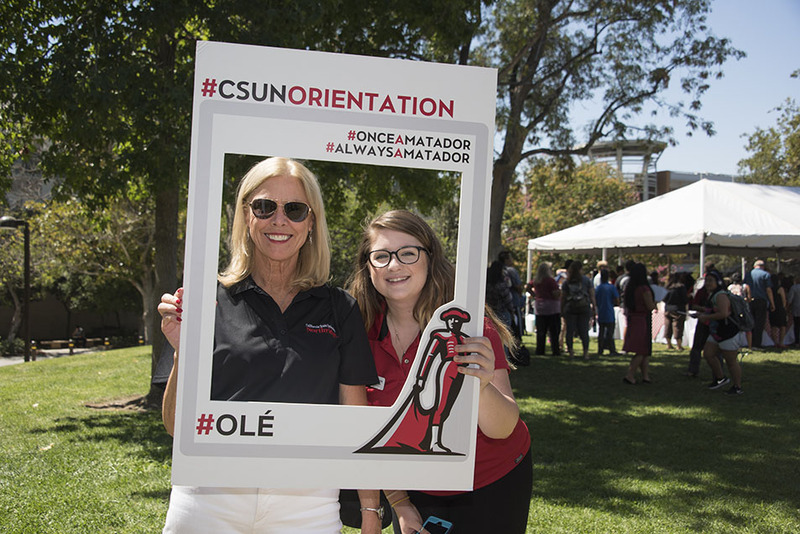 President Harrison poses with a student for a photo using a special frame at the annual President's Picnic on Sept. 1. Photo by Lee Choo. 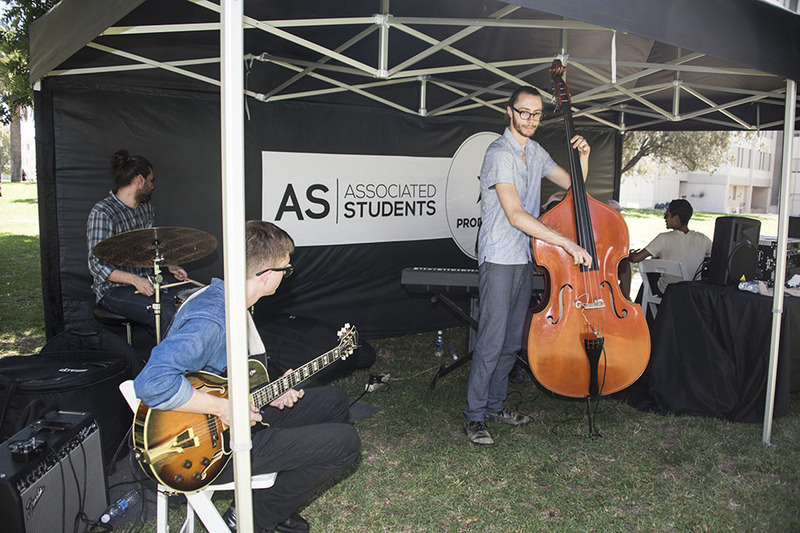 Musicians serenade students, faculty and staff at the annual President's Picnic on Sept. 1. Photo by Lee Choo. 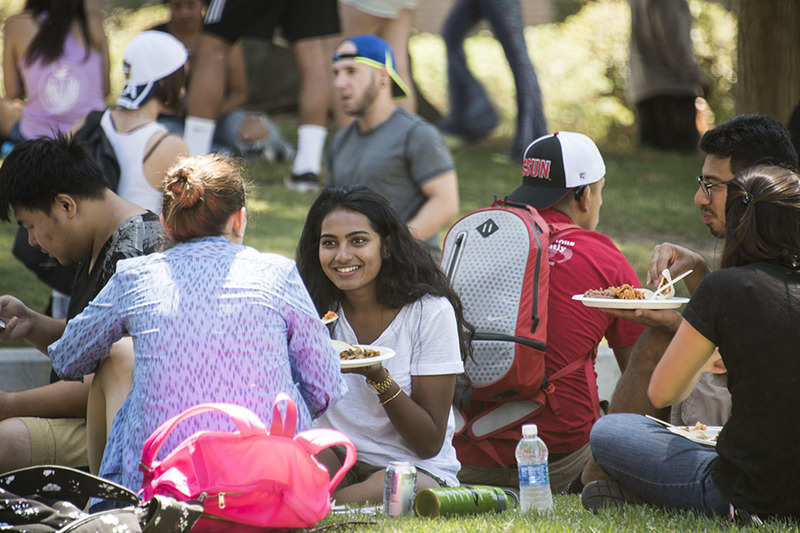 Students are presented with the opportunity to meet CSUN President Dianne F. Harrison at the 23rd annual President's Picnic on Sept. 1 on Bayramian Lawn. Photo by Lee Choo. 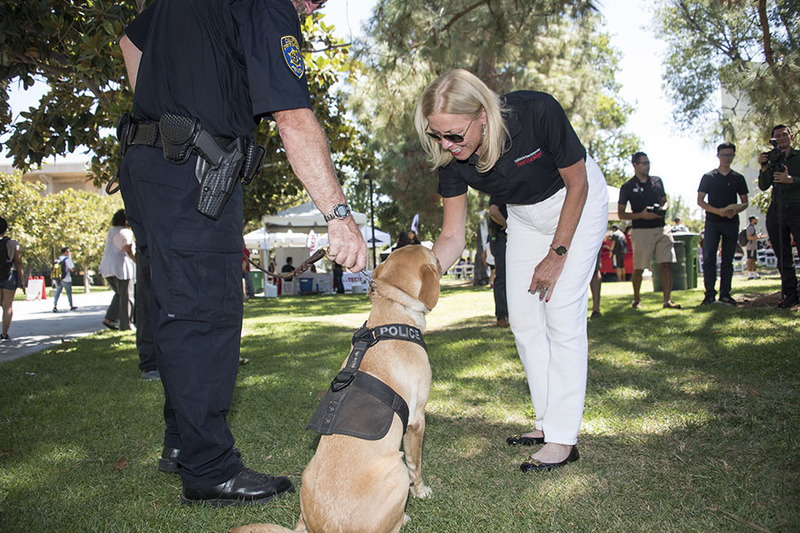 President Harrison greets Daisy from the K9 unit with a smile and a pet at the President's Picnic on Bayramian Lawn. Photo by Lee Choo. Volunteers help pass out free food to students, faculty and staff at the 23rd annual President's Picnic. Photo by Lee Choo. 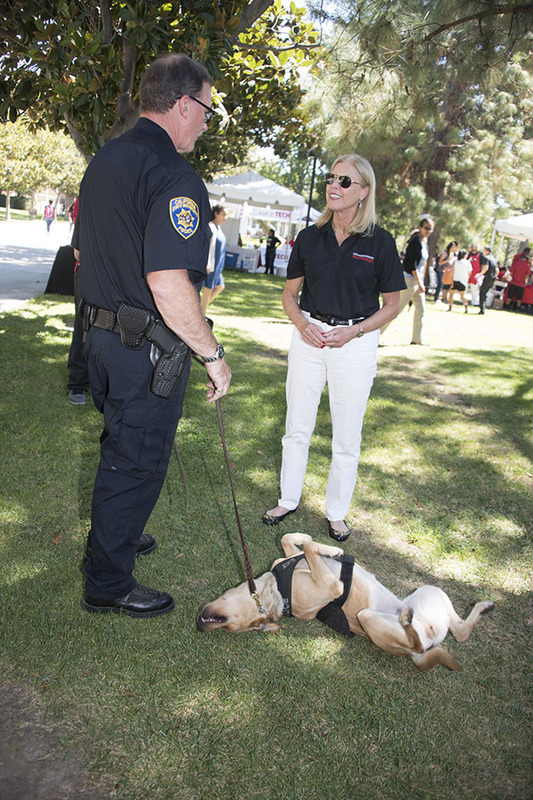 Officer Messmore and Daisy from the K9 unit meet President Dianne F. Harrison at the annual President's Picnic. Daisy even rolls over for a belly rub. Photo by Lee Choo. The lines for food were long but moved quickly at the President's Picnic on Sept. 1. Photo by Lee Choo. President Dianne F. Harrison pauses to take a picture with attendees during the annual President's Picnic on Bayramian Lawn. Photo by Lee Choo. Free chicken or veggie tacos, rice, beans, watermelon and beverages were provided from the Orange Grove Bistro for students, faculty and staff at the annual President's Picnic. Photo by Lee Choo. 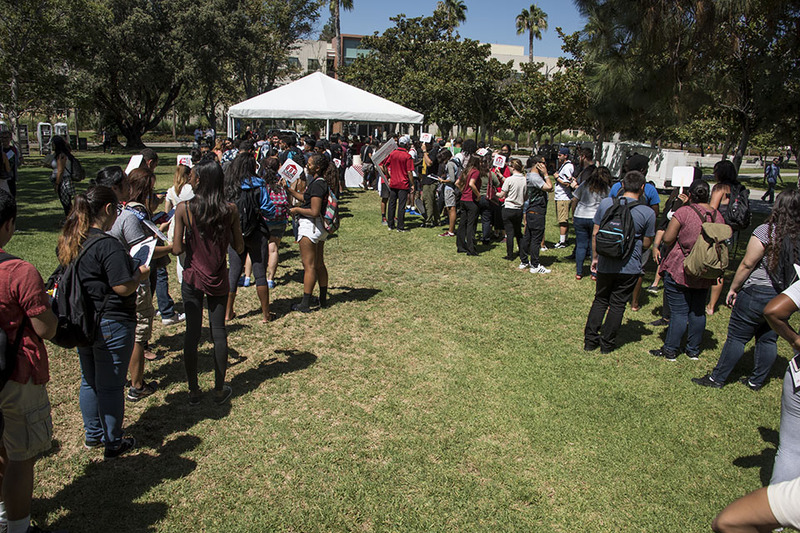 Long lines moved quickly and music filled the air as students, faculty and staff gathered on Bayramian Lawn at California State University, Northridge for the 23rd annual President’s Picnic on Sept. 1. 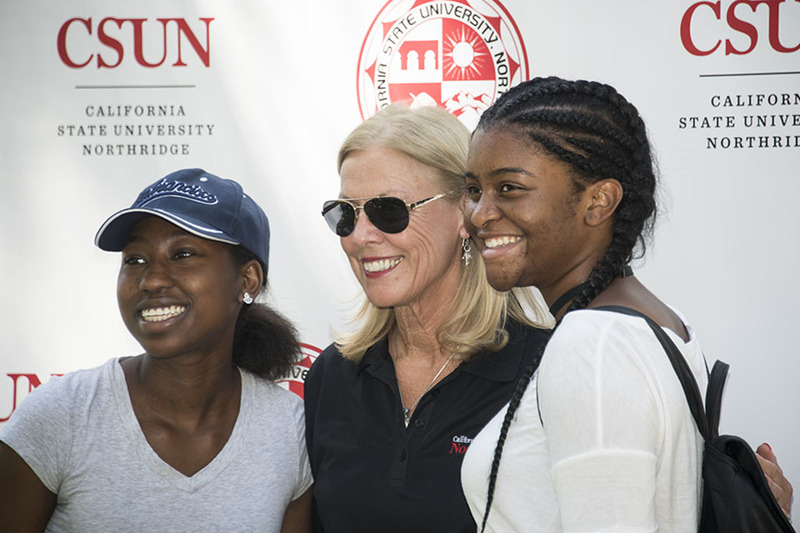 Casual events such as the picnic offer students an opportunity to see CSUN President Dianne F. Harrison in a different light. “It shortens the gap between the president and the students,” said sophomore civil engineering major Ali Al-Farsi about his second year attending the President’s Picnic. The annual picnic took place from 11 a.m. to 1:30 p.m. and again from 5 to 7:30 p.m. and offered free food courtesy of the Orange Grove Bistro, music and information booths, where students had the opportunity to network and connect with peers, faculty and staff, and mingle with President Harrison. 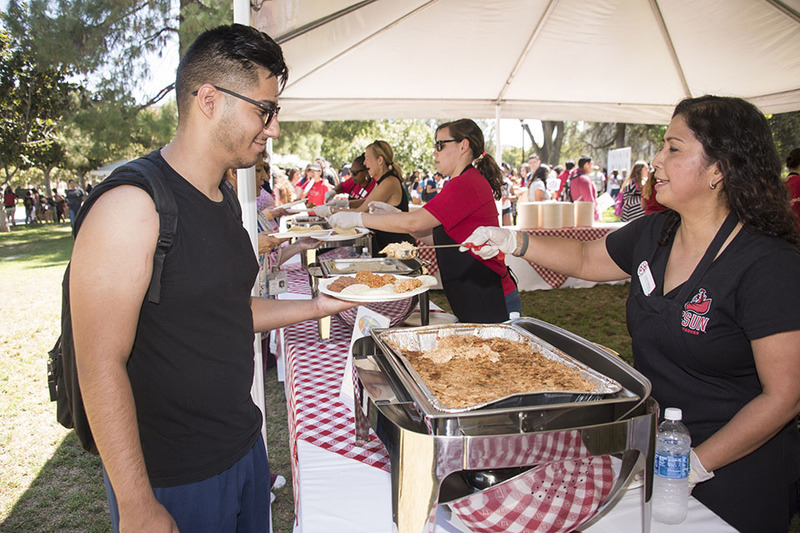 “It makes the students feel welcome and cared for,” said Dr. Eric Sletten, head team physician at CSUN’s Sports Medicine Clinic, who helped serve food to students, faculty and staff and has participated in the picnic since its first year in 1993.